Having gotten caught with their hand in the cookie jar for the umpteenth time, the boycotters are trying to find some way to make their recent “TIAA-CREF Divestment Victory” hoax not simply seem like yet another example of them being exposed trying to deceive the media and the public. The most recent BDS hoax is similar to previous instances where the boycotters have tried to portray simple (sometimes automated) business decisions as political choices made by one or more investment firms. In this case, TIAA -CREF apparently made no decision itself regarding buying and selling shares in Caterpillar (despite having been portrayed as doing so in defiance of a US Congressman in BDS fantasy press releases). Rather, one (and only one) of CREF’s many funds sold its Caterpillar shares as part of a routine indexing mechanism after the Morgan Stanley company MSCI dropped the company from their ESG social responsibility index that is followed by CREF. ESG is just one of many indexes retirement and investment funds tie themselves to. For example, S&P funds are only chartered to buy and sell stocks listed on the S&P 500. And if a company ever finds itself de-listed from the S&P, its stock would be removed from hundreds of indexed portfolios – automatically. The fact that the CREF story is based on an index that falls under the heading of “Socially Conscious” or “Ethical” investing has given the boycotters a hook to distract the public from their now-exposed TIAA-CREF fraud. For rather than continuing to claim that people within TIAA-CREF were responding to the boycotters campaigns, they are now claiming those campaigns bore even bigger fruit by causing Caterpillar to be de-listed from the MSCI index. Now Caterpillar was indeed removed from the MSCI list several months ago and, strangely, this alleged marvelous, fantastic, humungous “victory” never even made the BDS press. In fact, it only seems to have been discovered over the weekend while the BDSers were trying to change the subject from their recently exposed TIAA-CREF fraud. But doesn’t Caterpillar’s removal from an index labeled “Socially Responsible” mean that it is now considered an evil company, an opinion in alignment with BDS activists who have been harassing Caterpillar for years? As several commenters here have pointed out, the world of Socially Responsible investment is not quite so clear cut. For unlike indexes designed around specific market sectors (such as energy or manufacturing) or certain regions (such as Asian or European funds), the choice of which company represents an “ethical” investment varies based on non-economic belief systems. Generally, investments in tobacco, alcohol, gambling and weapons manufacturing are avoided by Socially Responsible investment funds (which increasingly travel under the banner of ESG for “Environmental, Social and Governance” investing). But as that new label implies, other factors such as environmental impact and corporate governance (usually referring to the state of state of employer-employee relations) are also taken into account when deciding who is in and who is out. And even within these categories, lines are not clear cut. If you look at slide 13 of this presentation, for example, the MSCI ESG index under discussion apparently does allow investment in cigarette, liquor and arms manufacturers, but draws the line at specific revenue percentages from these controversial industries. But the most important bullets on this slide are the second and third from the bottom which illustrate what divestment from a country actually looks like. For here MSCI lists two specific countries (Burma and Sudan) that have been specifically targeted as countries where investment should be avoided. In fact, the MSCI index is even harsher on these countries than they are on specific industries (for example, you can make half your revenue on liquor or firearms and still be in the index, but you can’t be invested in companies that support tyrannies in Sudan or Burma). Needless to say, a comparable inclusion of Israel into a similar blacklist is nowhere to be found within any ESG or TIAA-CREF materials, which makes the whole notion of drawing self-serving conclusions from who is included or excluded from those funds at best an act of speculation. As it happens, there are a host of reasons why Caterpillar might be considered marginal in this specific ESG listing. It is involved with the military (although at less than the 50% threshold). And the company has also had challenging labor issues recently, which included shuttering a plant after failure to settle a union dispute. Most importantly, any fund must contain only a finite number of investments, which means companies roll on and off these funds all the time – if only because they have been replaced by other firms that suit the fund’s portfolio more effectively. Absent any official word from MSCI regarding this decision, the BDSers have had to make do with offhand comments by unnamed people at both MSCI and TIAA CREF implying that Middle East issue played some marginal role in the MSCI decision. But naturally, no genuine proof (such as an official statement from either company) is offered since none exists (although the boycotters have gone into overdrive to condemn other people making equally speculative statements regarding why Caterpillar was delisted as liars and frauds – mirror, mirror). TIAA-CREF did not make any political divestment decision, but simply acted on a third-party indexing mechanism within its Social investment portfolio. And reasons why Caterpillar was removed from that specific index are currently unknown. “Palestinian Tractor is a truly Palestinian enterprise and is set to play a leading role in the country's economic and industrial development, as well as training and development to its Palestinian staff. Hmm, so if TIAA-CREF etc. 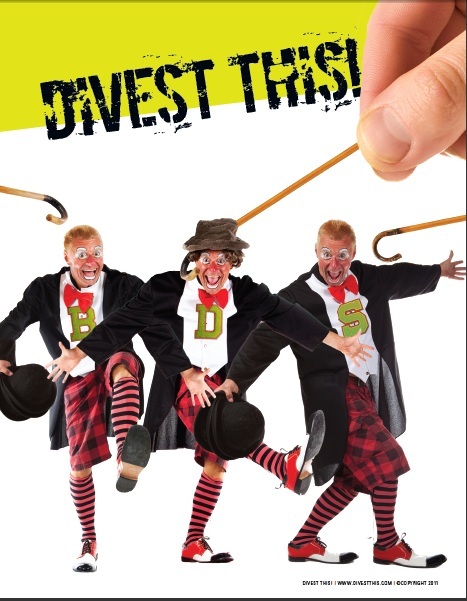 were to divest from Caterpillar, then it might end up hurting the very people the BDS crew wants to help! As a financial planner in Toronto, with a specialty in socailly responsible investing, I understand something of how it operates. I suspect that the decision to remove Caterpillar had more to do with its labour relations than anything else. Earlier in the year, in London, Ontario (about 200 km. west of Toronto) Caterpillar shut down a locomotive factory (Electro-Motive) putting 460 workers out of work. The factory was profitable but Caterpillar demanded the workers give up their benefits and cut their hourly wage in half. When the workers, quite rightly, refused, they were locked out and after a month the factory was shut down. This was big news in Canada, especially as Caterpillar had been given 5 million dollars in tax breaks by the federal government. It was an appalling way to treat workers and as mentioned, had more to do with their delisting than their connection to Israel (which has been long standing). On another front, we have 2 issues here. One is the upcoming United Church of Canada conference in August. Because the BDSer's cannot get anywhere, they are now pushing a resolution to boycott products made in the Occupied Territories, not Israel itself. Should they win, I can just imagine how they would spin that. Most offensive is a resolution where they claim “The deepest meaning of the Holocaust was the denial of human dignity to Jews”. Silly me. I always thought it was about the planned anihilation of European Jewry. Of course, by saying that, they link it to the occupation resulting in the loss of human dignity to Palestinians. You don't need me to make the connection of what they are implying. Finally, here in Toronto we have our usual Queers Against Israeli Apartheid marching in the annual Gay Pride Parade on July 1. QuAIA argue that gays have always been political and fight injustice which may well be true. However, a listing of participants in the parade show it to composed of gay and lesbian groups, some businesses, some labour groups and some political parties. There are no Queers for Aboriginal Land Claims, no Queers Against the Tea Party, no Queers for a Free Tibet. Only Queers Against Israeli Aparthied, the irony of which is lost on no one but them. Like a leech, this group needs to attach itself to an event that attracts tens of thousands of people, a joyful celebration about the gains the gay community has made.